It seems only yesterday that AMD shook up the staid server market with the introduction of its Opteron line of server processors. With a micro-architecture that included significant technologies, from having native 64-bit x86 instructions while retaining 32-bit support to the use of HyperTransport links for inter-processor communications and an integrated memory controller, the Opteron was an entirely different beast from its competitors and quickly gained market share. It hasn't always been plain sailing since but it's clear that the Opteron brand is here to stay. We have seen with our own eyes the processor growing from two to four cores and now, on its sixth anniversary, AMD has taken the opportunity to announce that its upcoming 'Istanbul' 6-core processor is months ahead of schedule and is expected to launch in June this year from OEMs. We guess the big unveiling will take place during Computex 2009 where AMD has customarily made big ticket announcements. 'Istanbul' is a native 45nm 6-core design sharing the same micro-architecture as the existing 'Shanghai' Opteron, with a new feature called HT Assist that improves throughout using the present HyperTransport links. 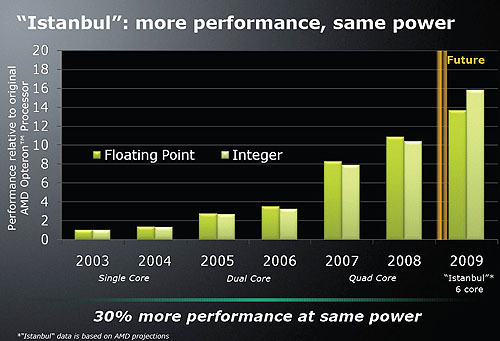 Importantly, 'Istanbul' has the same power envelope as current quad-core models from AMD. 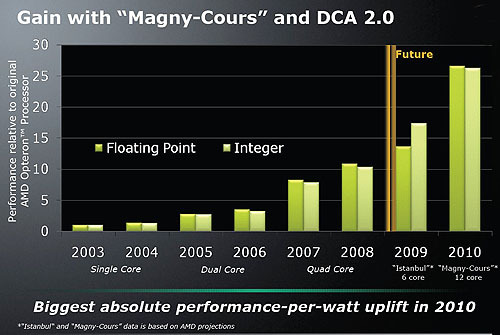 Performance however is increased up to 30% over the quad-core Opterons, with mid-range Nehalem Xeons expected to be its main competitor. It will drop into existing 2, 4 and 8 socket systems without requiring any hardware changes. Such backwards compatibility is an advantage touted by AMD that lowers the cost of upgrading for customers. That however is set to change next year. Along with the 'Istanbul' announcement, AMD also revealed its server platform roadmap for the next few years. More pertinently, we get more details on a new, version 2.0 of AMD's Direct Connect Architecture that is designed to handle more cores with a four-channel integrated memory controller, double that of version 1.0 along with four HyperTransport links, one more than the current version. This micro-architecture will be first found on AMD's follow-up to 'Istanbul' called, 'Magny-Cours', which will have up to 12 cores and looks like a dual-die chip. Sampling for this 45nm chip has already started, with availability expected early next year. 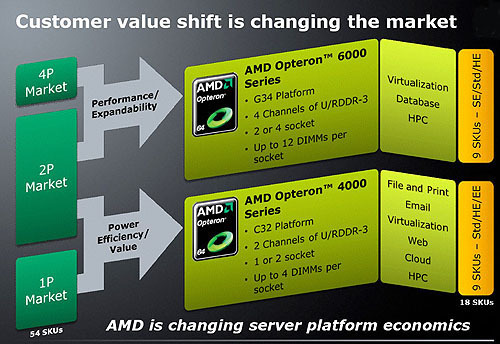 Along with the new micro-architecture is a shift in AMD's segmentation for its server products. The company believes that there are two diverging trends in the server market, with high-end computing applications going for raw performance and scalability while the lower-end market favors power and cost efficiency. With this in mind, the Opteron line will be split into two series, with the higher end 6000 series catering to high-performance computing and virtualization spaces (2P and 4P servers). This will occur early next year on the 'Maranello' (G34) platform, with 'Magny-Cours' processor (of the 8 and 12-core variety) spearheading this segment. These processors will be replaced by 32nm designs 'Interlagos', which will have 12 and 16 cores and will be based on the new 'Bulldozer' core. That's expected to occur in 2011. The 'value' 4000 series will focus more on providing power efficiency and value to handle cloud computing and web applications. They will be used in 1P and 2P servers using the C32 platform and are represented by 4 and 6-core processors known as 'Lisbon'. Similarly, 32nm variants with 6 to 8 cores ('Valencia') will succeed 'Lisbon' in this series. Essentially, with the shift to the 4000 and 6000 series processors, these AMD processors will not be pin-compatible with each other, nor will they be compatible with existing platforms. AMD cites this is essential to better cater to the respective segments instead of a one-size fits all solution as it has been for all these years. As much as we hate to say this, this looks like a path that Intel has been following for a long time with separate platforms and processor sockets. Finally, AMD also launched a new Opteron EE processor (using the existing 'Shanghai' core) that is rated at 40W ACP (Average CPU Power), which is the company's lowest ever power band for a quad-core server processor. AMD reckons that the new processor will enable a 13% reduction in power consumption on the platform level, with a 14% lower processor power draw at idle. Again, it's targeted at the cloud computing environments where energy efficiency is king. So there you have it, AMD's plans for the server platform for the next couple of years and it appears that cores and more cores is the answer to everything. We'll be looking out for more developments in this space and you may even see 'Istanbul' on a HardwareZone page near you later this year.